Is 85 kg Weight & 172 cm Height Obese or Overweight? 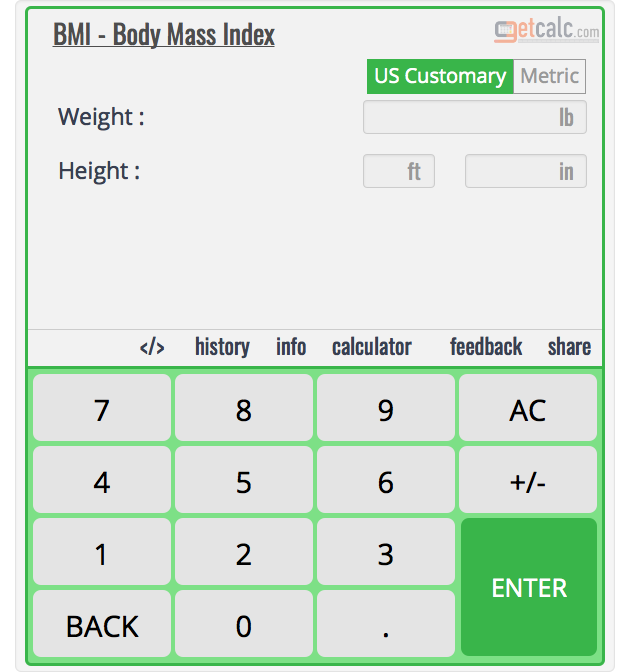 getcalc.com's BMI calculator to find if a male or female of 85 kg weight & 172 cm height is obese, extreme obese, overweight, underweight or ideal weight. According to BMI chart and their classification, BMI score of 28.73 for 85 kilograms weight & 172 cm tall indicates that your weight is Overweight. The Body Mass Index of 28.73 is derived from the weight of 85 kilograms divided by the square of height 172 centimeters. You are weighing 11.34 kg more than the healthy or optimum weight. Burning more calories or reducing the excess weight 11.34 kg by your proper diet & exercises can brought your weight to 73.66 kg in order to get your BMI score to 24.9. BMI chart for 85 kg weight & 172 cm height and its nearest weights to let you know how your height & weight describes you. What is the BMI for height 171 cm and weight 84 kg? What is the BMI for height 171 cm and weight 85 kg? What is the BMI for height 171 cm and weight 86 kg? What is the BMI for height 172 cm and weight 84 kg? What is the BMI for height 172 cm and weight 86 kg? What is the BMI for height 173 cm and weight 84 kg?